A template has only one set of fields. A field can be shown on: staff page, single page or both. You can change in what order the fields are shown on the page. You can set different display order on staff and single pages. You can hide or delete fields. Staff Page. 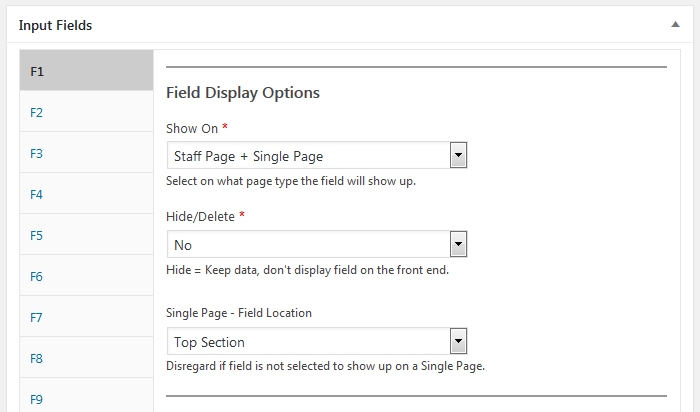 The field is displayed on staff page (grid or list). Single Page. The field is displayed on a single page. Staff Page + Single Page. The field is displayed on both page types. No. Default. Field shows up on a page. Hide. The field doesn’t show up on the front end. Data can be updated and used for a filter. Delete Field. Both the field and all data entered in the field are deleted.